Welcome to Day 1 of a 5 Day Blog Hop. 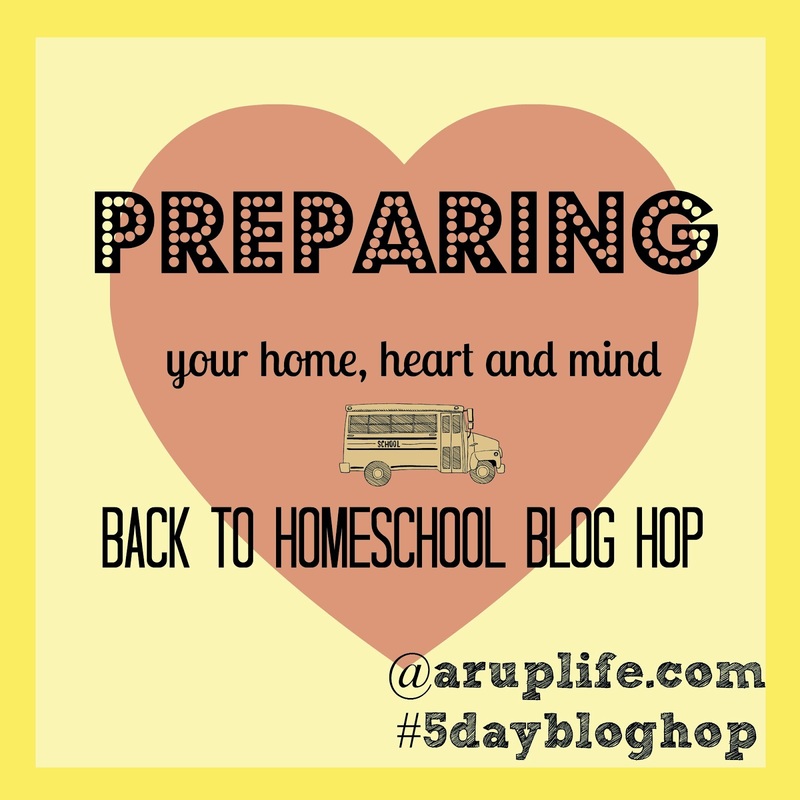 This month's theme is Back to Homeschooling. I'm going to be sharing thoughts on preparing, planning and finally what curriculum we will be using. Today's thoughts are on Preparing Home, Heart & Mind. I like to take the few weeks before we start a new school year tackling home jobs. This includes cleaning, organizing and purging. So far I've tackled most of my laundry room, my preschooler's room and the living room. During the school months there isn't always time to do this. I don't like feeling like I should get big projects done - but can't fit them in. So now is the time! Taking the time to remind yourself the reasons you wanted to homeschool in the first place will help refresh you for the upcoming year. If you don’t remember, make a new list. Is it financial? Educational? Was it to spend more time together as a family? Was it God’s calling? Did you dream of being a homeschooling family before you had children? It is very important to take the time to reflect on these reasons. Remember the passion you had that first year. This will bring about excitement for the new year! This one is tricky. I've really taken time to evaluate our schedule for the upcoming year. I find that leaving the house during school hours really throws us off. This year piano lessons will have to be after 3pm. Having them in the morning just didn't flow right for our day. Another thing is I'm going to have to figure out my shopping run so that I have food on Monday mornings and don't have to run out first thing. This means either running after church on Sundays or possibly using the delivery service. I also want to have a stricter blogging schedule. The fall is my busiest time for blogging and I need to keep that in check. Trying to put a time limit on internet will be hard but it is something that will help with overall success for all of us. I hope these tips will be something that blesses your homeschooling plans. Join me tomorrow for planning tips! What a great idea to tackle the homemaking projects before the school year begins. Seems like it would be more efficient than trying to do spring/fall cleaning while also trying to stay on top of homeschooling. This is a great idea to tackle #homeprojects during the weeks before school starts. This is a great #bts idea. Thanks for this suggestion. Great tips! I am working on my getting the house in order, but I've had to wait until my husband was able to finish putting sheet rock in the garage. I expect with everything else we have happening in the next few weeks I will still be working on that after school starts. I guess I will focus on getting my mind & heart prepared!